The Northside Achievement Zone (NAZ) is a collaboration of community organizations whose mission is to build a culture of achievement in North Minneapolis to assure all youth graduate from high school college-ready. The NAZ model is a two-generational approach that offers services simultaneously to children and their parents. 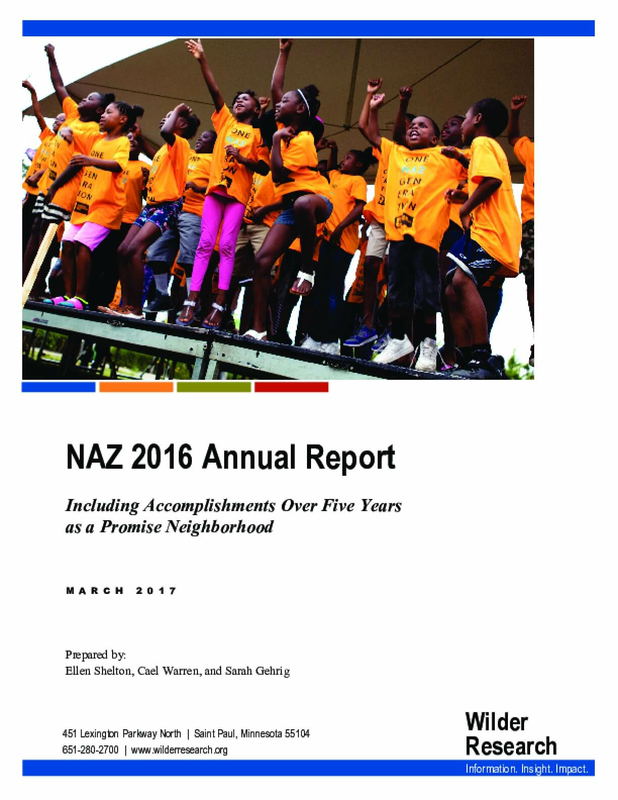 This annual report details the findings and accomplishments over five years as a Promise Neighborhood. Learning From Student Voice: Are Students Engaged? When students have a love of learning and a desire to succeed ─ when they are genuinely engaged with their school and their education ─ they are more likely to learn. Since student engagement is a leading indicator of academic achievement and persistence in school as well as a key element of school climate, educators can greatly benefit from measuring it. So, what does engagement look like, according to the students themselves? To answer this question, YouthTruth analyzed survey responses from over 230,000 students in grades three through twelve. The data was gathered between November 2012 and June 2017 through YouthTruth's anonymous online climate and culture survey, administered in partnership with school districts and charter management organizations across 36 states. 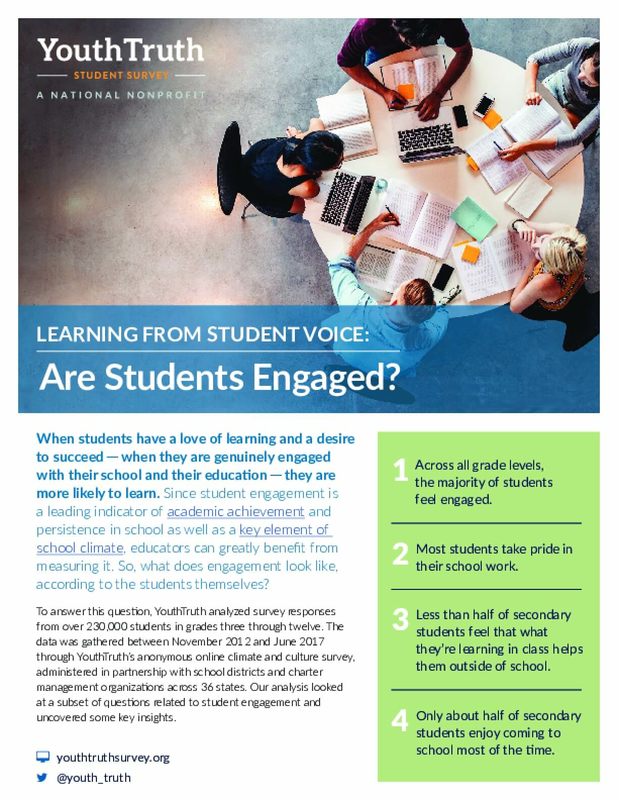 Our analysis looked at a subset of questions related to student engagement and uncovered some key insights. At Great Lakes we focus on helping students of color, students from low-income families and those who are the first in theirfamilies to attend college. These underserved students have the most to gain from earning a degree or credential, but face the steepest challenges in getting there. One of the first barriers they need to overcome is "summer melt." 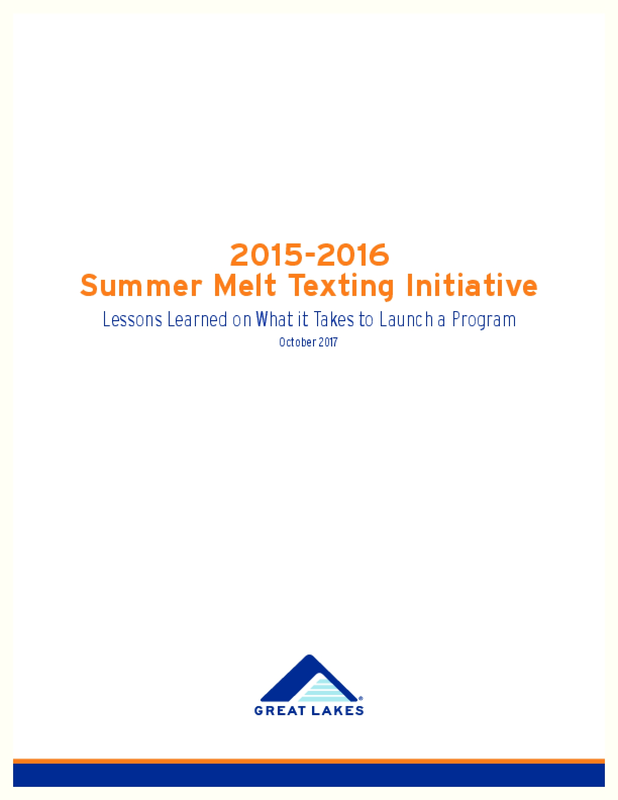 The purpose of this report is to share lessons learned by three high school districts during the development and launch of a summer melt texting program. What is on the five-year horizon for academic and research libraries? Which trends and technology developments will drive transformation? What are the critical challenges and how can we strategize solutions? These questions regarding technology adoption and educational change steered the discussions of 77 experts to produce the NMC Horizon Report: 2017 Library Edition, in partnership with the University of Applied Sciences (HTW) Chur, Technische Informationsbibliothek (TIB), ETH Library, and the Association of College & Research Libraries (ACRL). 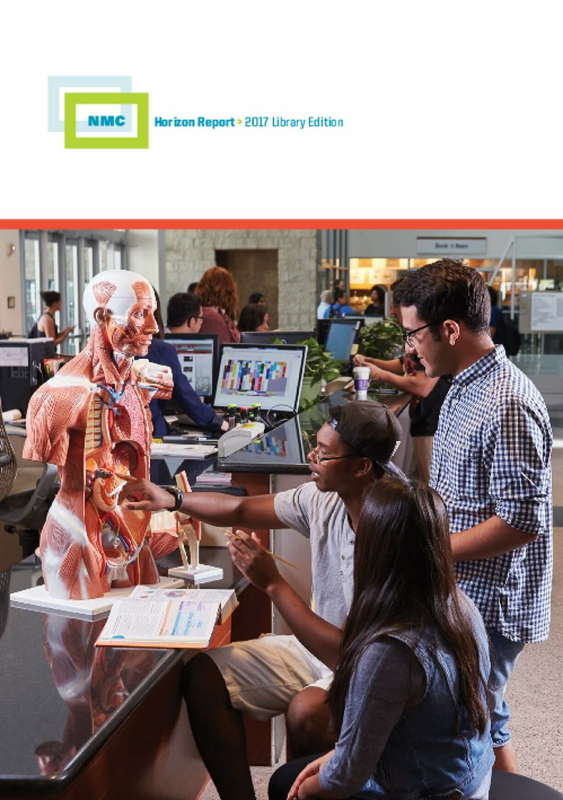 Six key trends, six significant challenges, and six developments in technology profiled in this report are poised to impact library strategies, operations, and services with regards to learning, creative inquiry, research, and information management. The three sections of this report constitute a reference and technology planning guide for librarians, library leaders, library staff, policymakers, and technologists. 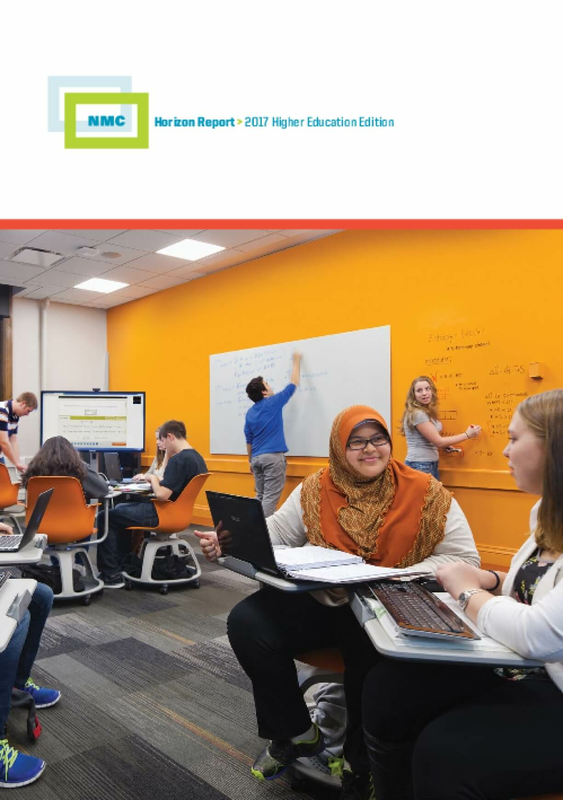 The NMC Horizon Report > 2017 Higher Education Edition is a collaborative effort between the NMC and the EDUCAUSE Learning Initiative (ELI). This 14th edition describes annual findings from the NMC Horizon Project, an ongoing research project designed to identify and describe emerging technologies likely to have an impact on learning, teaching, and creative inquiry in education. Six key trends, six significant challenges, and six important developments in educational technology are placed directly in the context of their likely impact on the core missions of universities and colleges. The three key sections of this report constitute a reference and straightforward technology-planning guide for educators, higher education leaders, administrators, policymakers, and technologists. It is our hope that this research will help to inform the choices that institutions are making about technology to improve, support, or extend teaching, learning, and creative inquiry in higher education across the globe. All of the topics were selected by an expert panel that represented a range of backgrounds and perspectives. 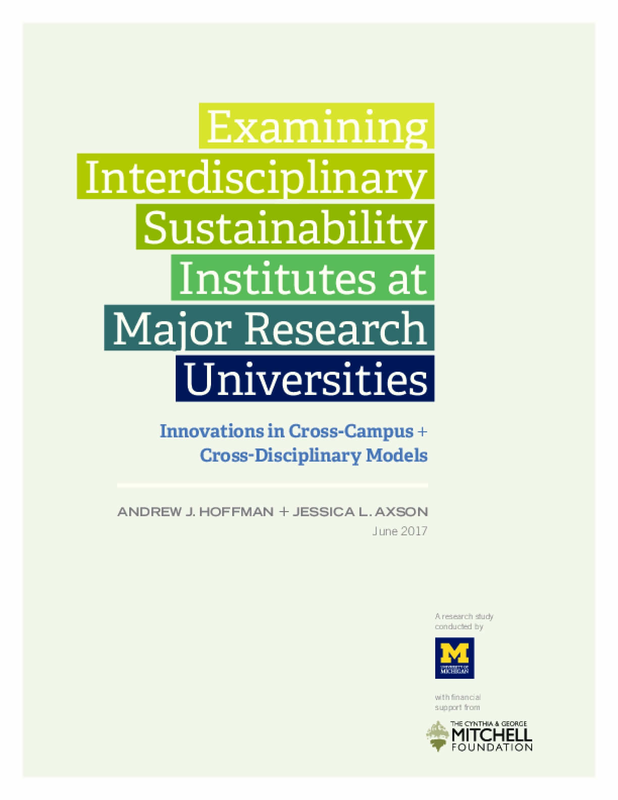 This is a study of the distinctive characteristics, activities, challenges and opportunities of a specific type of sustainability institute, one that spans the many disciplines of the university and, to do so, reports to upper administration (provost or vice president of research). Among research universities within the Association of American Universities (AAU), 19 were identified, and 18 agreed to participate in this study. Directors are sent a 71-question survey in January 2017 that covered issues of Governance, Research, Education, Engagement, Campus Operations and Best Practices. Public education is a cornerstone of democracy. In the U.S., however, a growing number of families are withdrawing from the public school system, by choice or because that is their only option. Many of these families did try public school, but found it did not meet the needs of their children at at that time and place. 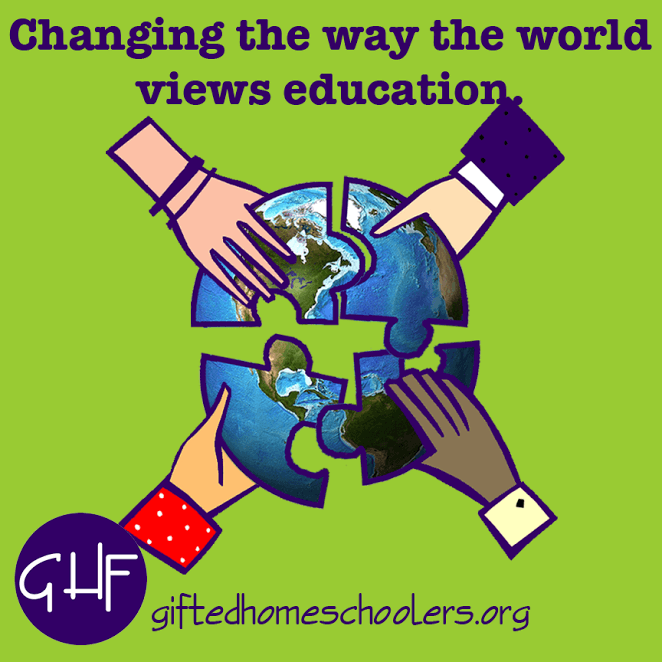 Dismissing all homeschoolers as anti-school would be an unfortunate mischaracterization. With over half of jobs now requiring a postsecondary credential, college completion has never been more important. Yet it remains elusive for too many students -- especially students from low-income backgrounds, students of color and first-generation students. For 50 years, Great Lakes has focused on helping traditionally underserved students who have the most to gain from a college education -- yet often have the least support in getting there -- make their way to and through college. Our 2015 report highlights the three distinct and purposeful funding approaches we use in pursuit of this goal and details several grants we made over the past year.